Lent is, hands down, my favorite season. My small family is not Catholic, but we believe in embracing truth and beauty wherever it can be found. And Lent is truly a season of truth and beauty. Lent has three main tenants: prayer, fasting, and alms giving. For the past eight years or so, my husband and I have embarked on a number of Lenten adventures. One year we fasted during the day for the season. One year my husband gave up talking. One year he shaved his head every day and I covered my hair. And always, prayer, fasting, and alms giving are in the background of our journey. This year I decided to take on a period of silence. Many of you know that I drive around 3 hours a day to and from school and work. Most of the time I use my driving time to stay connected to the world through NPR or maintain membership in bookclub by listening to audiobooks. With Remy and working and reading for class and writing briefs, I have had very few opportunities for quiet reflection in the last year. So I thought, why not take back my time in the car? Let me just tell you: I haven’t been successful yet. I was feeling really good on Wednesday. My drive is short, and I was with Remy for most of it. It was easy not to turn on the radio. Thursday was okay, I made it most of the way to school but none of the way home in silence. Friday I got a reality check. First I thought, “I need to know what’s going on in the world, so it’s okay if I listen to NPR until I get to the highway.” I was “rewarded” with this StoryCorp interview. I literally sobbed for most of the story and at least one story after. A good reminder that I should just stick with the plan, and turn the radio off. Once I was on the open road and dry-eyed, things went better. I used the quiet to reflect on the beautiful sunset. I let my mind wander to friends and family and prayed for each of them. I thanked God for the wonderful season of Lent and the lovely life that I have. But after an hour, things began to digress. I began thinking about the Federal Rules of Evidence and how they might apply to a complicated hypo that I had created. When I caught myself, I tried to justify this act as somehow spiritual – perhaps my mastery would one day bless someone less fortunate in some roundabout way. Then I started thinking about how I needed to get my oil changed – can paying for services rendered be considered Alms Giving? If so, I was about to make a major Lenten contribution to the hard working folks at the Grease Monkey. These thoughts were interrupted by some jerk who cut me off, so I prayed for his soul. Obviously he needed it, and I needed to get back to praying (I reminded myself this was the whole point of this exercise). Like I said, things digressed. 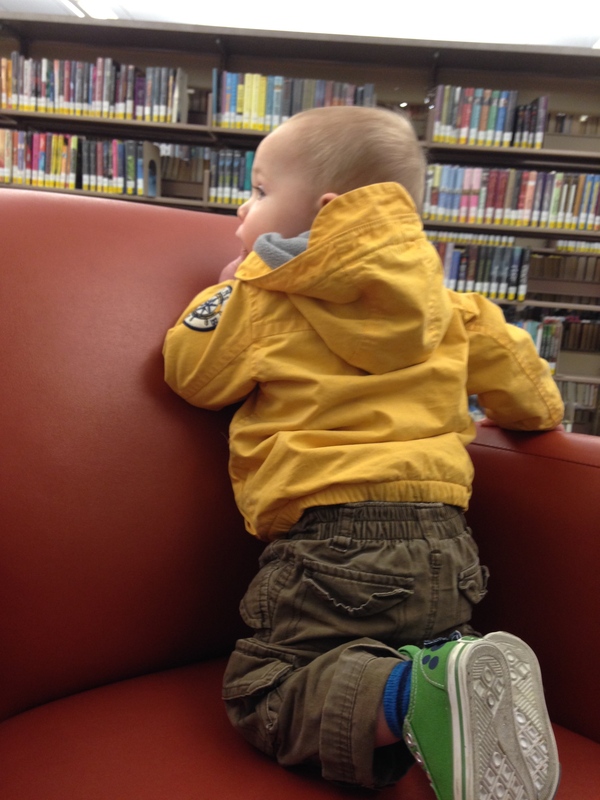 We may or may not have spent an entire hour climbing up and down this chair at the library. Time well spent – probably. I realized on the drive home yesterday (yes, in silence… mostly) that unoccupied silence is a hard and uncomfortable thing. I was surprised. After all, every day that I’m home with Remy, I pray for two hours of silence while he’s napping. And I revel in those two hours of silence. But my mind is never left to wander in those two hours. Those two hours are precious and not to be wasted on staring into space, communing with my maker. No, they must be crammed full with casebook reading and blog writing and dish washing. I mean, honestly, when else can a mom get anything done? I do realize, theoretically, that taking time to just be is not wasting that time. I try very hard to take time to just be with Remy and count that time as very well spent. Why is taking time to just be with my own thoughts or to just be with God or to just be with the squirrels in the backyard any different? That’s my challenge for this Lent, I suppose. Realigning what is important. Which, really, is what Lent is all about in any year. How do you take back moments to just be with your self or with God? I so much love how you write dear friend. This whole “quietness” you speak of is so hard for me. I’ve actually made it my new years resolution to learn how to “relax” and be alone with my own thoughts. Doesn’t that sound a little ridiculous? And yet, it is the area I struggle the most in my journey to know myself better and become more connected with my family, the earth, and my Creator. Silence is scary. It welcomes unwanted thoughts too that make me have to confront uncomfortable feelings I have about myself or others. It makes me actively participate in this whole “becoming” part of my humanity. This is a great reminder for me about what Lent looks like and what I’d like to be focusing on as well. Thank you for living in the struggle alongside me. Cheers – to silence – and uncomfort. With a growing family and a busy business and the adventure of everyday life, learning to relax and be with your own thoughts doesn’t sound ridiculous to me. It sounds like a big and admirable challenge. The quiet mind though, is something else. Having a chance to release the pent up emotions of a day, a week, a life, can help to allow the spaciousness to form. Music helps me to get in touch with what I need to move through to find a calm place. I often have resistance to feeling those feelings in order to let them go…. I don’t do New Years Resolutions… But each year, there is a word or phrase that I spend the year reminding myself of and focusing on. A few years ago, I chose “Be still and know that I am God” from Psalm 46:10. And what I learned in a year of practicing stillness, quietness, and consciousness of the presence of Christ is that sometimes, you encounter the Spirit in the places you didn’t intend to…. And sometimes, you can’t find the Spirit in the places you’re looking. So in a year of practicing being still really, really, hard, I began to learn that sometimes, the way I intended to be still (like practicing a period of silence during Lent) was actually where I realized just how overwhelming my experience of Christ in the everyday was (like hearing a beautiful, heart-wrenching story on NPR). I found, often, that in silence, my mind wandered away to the to-do list and the background noise and not to God, where I wanted it to stay focused. But that’s the beautiful thing about the way we have been created… With ideas, and thoughts, and lives, and friends, and things we love. And after a year, I finally began to grasp the idea that God is in those wanderings, too. So not being able to stay focused or sit in that silence? It’s not a failure. It’s beautiful, wonderful, challenging new way to experience the Living Christ. Laura, this is so beautiful and very much a reminder that I need to hear. Thank you so very much.